In this recipe, Zubaida Tariq used chicken cube flour. To make that flour you have to mix 2 1/2 cups of refined flour with 10 chicken cube packets (such Knorr Chicken Cubes widely available in the local grocery store). You can store this mixture in an air tight jar in the fridge and can use as required. You can also freeze the cottage cheese kebabs and fry these whenever you need. In a bowl grate cottage cheese and add onions, mint leaves, green chilies, soya sauce, chicken cube flour, cumin seeds, black pepper, red chilies, and salt. Mix it well till it combined. Cut the sides of bread slices, crumble the slice and add to cottage cheese mixture. Mix it well again. Keep it aside for few minutes. Beat eggs in another bowl. Shape the cheese mixture into any shape which you like for kebabs. 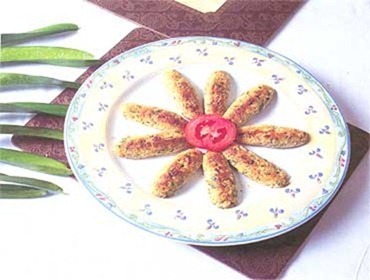 Roll the kebabs in egg and then coat them with bread crumbs. Heat oil in a pan and fry kebabs till they are golden in color. Serve with a sauce of your choice and enjoy them with your tea or as a side dish of your dinner.